The Déise will face Galway in their Allianz Hurling League semi-final after an impressive display at Walsh Park. Waterford's Kevin Moran with Peter Duggan and Aidan McCarthy of Clare. STEPHEN BENNETT ACCOUNTED for a remarkable tally of 16 points as a rampant Waterford cantered into a National Hurling League Semi-Final against Galway next weekend. Only a week on from edging out the Tribesmen, Paraic Fanning’s side ensured a last four rematch after putting 13 man Clare to the sword in devastating fashion when outscoring the visitors by 0-20 to 0-04 with the aid of a strong wind in the second period. The foundations of victory were laid in the opening half however when matching the Banner all the way against the conditions to only trail by two at the break at 1-10 to 0-11. After an early blow-for-blow pattern, wind-assisted Clare finally broke free with an unanswered 1-2 from Peter Duggan placed balls approaching the end of the opening quarter. After a brace of frees, the 2018 All-Star rifled a 15th minute penalty earned by Gary Cooney to the left corner of the net despite a strong hurley from goalkeeper Stephen O’Keeffe at 1-6 to 0-4. Waterford inched back into the tie mainly through Stephen Bennett’s unerring accuracy from frees but the hosts were fortunate to survive a late goal chance for Cooney who turned his marker and bore down on goal, only to bat to the side-netting. 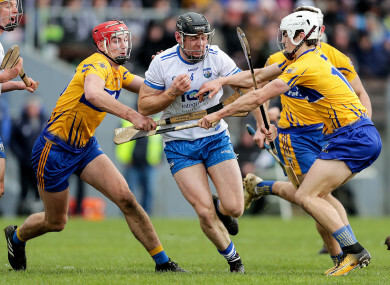 It was a totally different landscape on the turnover however as Waterford fired the first five points to nudge into an advantage that they would never look back from. The untouchable Stephen Bennett accounted for his ninth point of the half to help the hosts ease 0-24 to 1-12 clear by the 58th minute, with Clare’s forgettable afternoon only getting worse as a straight red card for Conor Cleary was compounded by a second yellow for Duggan just before the final whistle. By then, Austin Gleeson and Pauric Mahony had piled on the misery on the scoreboard as Waterford hit the 30 point mark on a scoreline that certainly didn’t flatter them in what was a dry run of the sides’ Munster Senior Championship opener in eight weeks’ time. Email “Pinpoint Stephen Bennett scores 0-16 against Clare as rampant Waterford canter to semi-finals”. Feedback on “Pinpoint Stephen Bennett scores 0-16 against Clare as rampant Waterford canter to semi-finals”.